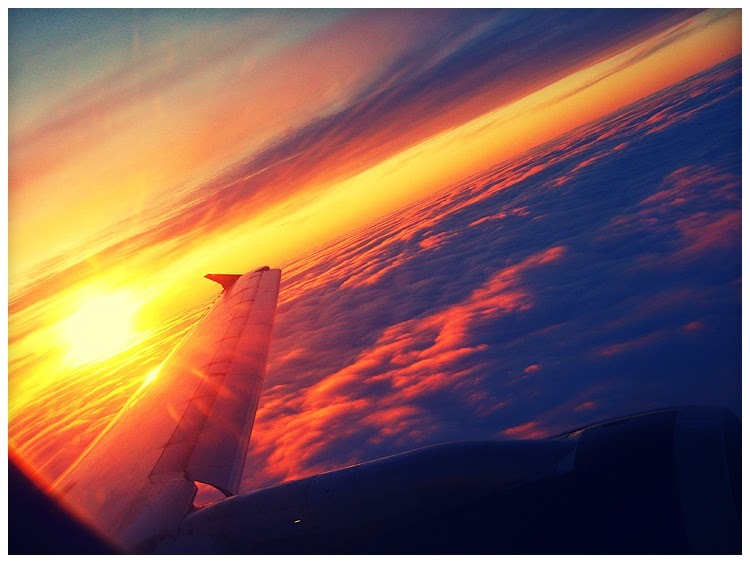 I will try to keep it short and easy since im still in jetlag form the long hours of flying. After a 2 hour flight to London, Heatrow and a 6 and a half hour flight to Boston we were there. The country made out of dreams, we went to the bagage claim and picked up our bags and went on to the rental car dealer. we rented a Ford Explorer and i got to choose color, so i choosed a dark grey one. 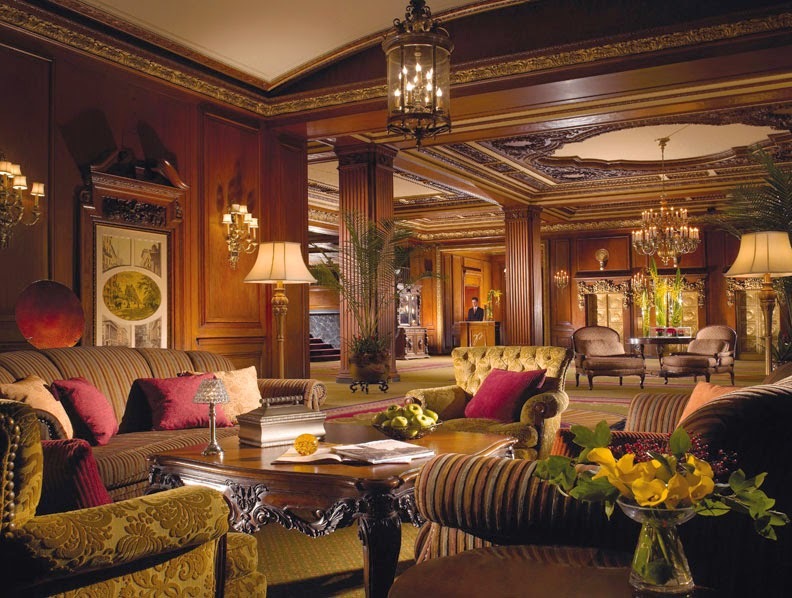 At this point we were pretty tired and hadn´t sleept for 20 hours, eventually we arraived at our hotel called Omni parker house, wich is the oldest hotel in the united states so we cheked in and left our bags up in the room. After that it was game time the Bruins vs Canadiens, the game is possibly the coolest thing I have ever been to, it was so loud in there that it feelt like an earthquake when the bruins scored. After the game we really feelt the lack of sleep in our bodies so we went walking the 500 meters back to the hotel from the arena. We woke up around 9:30 am wich was not good because we had agreed with my fathers colleauges that we would meet 9 am in the lobby so we dressed quikly and went down to the lobby but they had already left so we went across the street to starbucks and there they were sitting with donuts and coffe on their table, only in america. 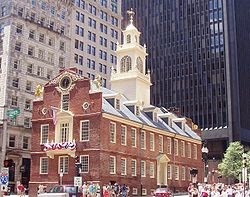 Boston has a special infrastructure that mixes old houses with new ones, the train station in the iddle of the city was built in year 1713 and is surrounded by skyscrapers. in 1713 it was not a train station it was a court house. After the tour it was evening so we went to the old city hall were they have a reallt fancy resturant, it must have been the beast stake I have ever eaten in that resturant, I didn´t think steakes like that existed, but I didn´t now prices like that existed either but it was worth it. This was a really interesting day for me, my fathers cause for the trip over was to visit the factory in Randolph wich is 25 minutes from Boston. We went to the factory and we were meet like kings, first of all our names were on the wall then we were escorted in to a conference room were we got a lot of gifts and so on. Then they talked for like three hours about their products and then we we ended the visit with a three hour walk in the warehouse. After our visit the invited us for dinner so we said yes and they gave us the adress and said that we would have to be there 5:30 pm. When we got there it was amazing one of the most beutiful golf courses i have ever seen. 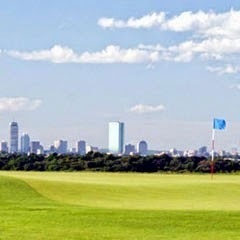 The golf course resturant were located up on a hill so as the sun went down you saw the Boston skyline light up, it was really an amazing feeling. We ate lunch at Cheescake factory wich is an awseome resturant their fodd is the best, and their cheescake is even better. After that we went to Abercrombie and Fitch and there after we went back to the hotel so i could hit the gym. We ate dinner at a place in downtown not a speciell place but the food was okey. After that we went back to the hotel to get some sleep. This was sadly our last day in Boston, the flight took of around 7 pm so we had some hours to kill. We bought tickets to the New England aqvarium and went around there four a couple of hours and watched big whales, sharks, stingrays. It was pretty interesting. After that we went around in some stores i bought some Bruins accessories and a hat. Then we went back to the hotel picked up our bags jumped in the car and headed for logan airport. We flew with Brittish Airways a Boieng 747 it took around 6 hours and 7 minutes, and form heatrow to Stockholm it took 2 hours and 20 minutes. Today we arraived in Santa Monica California. I have been in Los Angeles a couple of times before and I really love this city so it´s really nice to get back. When you see this sign you feel both releafed and a little bit sad, you feel releafed because we had been in the car for three weeks and it gets quite boring after awhile. 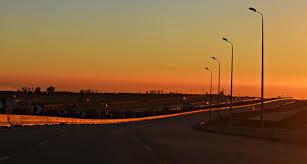 It feels sad because all the things we experienced is over, all the diffrent land landscapes we been driving trough, like i said in the beginning it´s not many people who get to experience a sunrise in the new mexico desert. You cant really put a price on those things the things you get to see. and with a car like our little red Corvette on roads like this it couldn´t get any better. So i feel both releafed and sad, actually i feel more sad I will miss the early mornings in the mountains and deserts, and all the citys in so diffrent conditions. I dont know what it is with ghost towns but they impresses me, it looks like all the people who lived there just stood up and left. I didn´t manage to get my hands on a ticket or actually i did but the next home game was in a week so it was no idéa we dont have the time to stay in one place for so long. So we drove of in our Corvette. We ended up in Texas in a town called Amarillo, it was a 7 hour drive there from Oklahoma City. Amarillo played against Fresno Monsters, NAHL is a tier 2 junior hockey leuge which stretches from the eastcoast to the westcoast. Amarillo is located in the upper part of Texas, Amarillo has some problems with water only 0.50% of the land i water covered and with very little rainfall water is a problem, but people survive so they must get there water from somwhere. 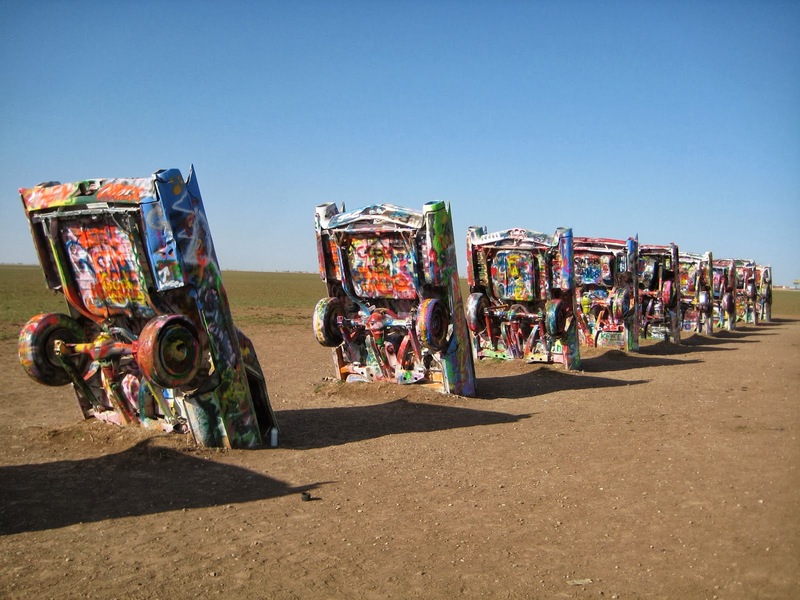 Anyway we travelled to the Cadillac ranch, it´s a weird place where several Cadillacs are standing with their fronts down into the ground and then you can buy paint and spray and write things on them. As you see it was a amazing view driving into downtown Oklahoma city. It gave us the oppurtunity to test our little red Corvette down the strip, it sure did turn some heads around as we pushed the throttle down and a mighty V8 sound came out from the engine. Since we are afraid of the american police we only had the guts to do it ones. Oklahoma is a really nice city I really felt in love with it from the first moment, Oklahoma is the 29th largest city in U.S.A. 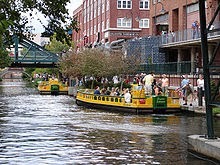 In downtown Oklahoma they have water going trough the city and you can jump on a water taxi if you feel like it, so the city does not have a big city feeling it actually feels kind of small and cozy. 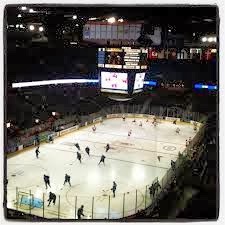 I really love ice hockey and the best part is that Oklahoma has a team called Oklahoma city barons, and they play in the second highest league in the states. I hope i will get my hands on a ticket for the next game and i hope they have one pretty soon as I will have to move on we cant get stuck in one city for a long time. 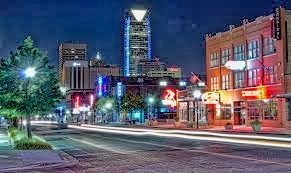 Oklahoma has many College schools and since i like this city I might apply to a school here. So for anyone who likes green enviorment with the water closeby and a nice weather with an average of 34 degrees celcius in August I would recommend this city. Today we arriaved in Springfield a town in Missouri. A fun thing is that in Illinois there is a town called Springfield to. There is two towns with the exact same name in the states next to each other. Anyway it was a seven hour and 45 minutes drive from Chicago, the drive went smoothly aside from a flattire but we fixed it in ten minutes and drove on. I have really fallen in love with our Corvette, everybody says that american cars are famous for their bad quality and bad handeling, but our car it feels diffrent it has a soul to it it has a certain feeling it is a plesaure to drive down the old route 66. Springdield it was, we arraived here and saw from the first moment that it is a pretty poor area. 16% of the people are living below the poverty line so it is mixed emotions driving trough and seeing all the people fighting for their survival. 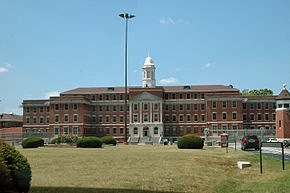 The United States Medical Center for Federal Prisoners in Springfield Missouri. We drove by this building, it´s a fascinating building for sure it´s one of six places in the states that take care of prisoners with all sorts of problems, it´s a fascinating building but i think i rather stay and look on it from the outside. We drove on from springfield along the road. 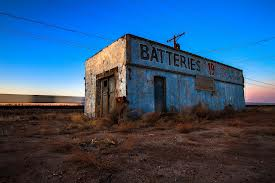 It´s a shame that route 66 dosen´t exist on modern maps anymore, it would be so much easier for you guys to follow our yourney, but we can´t do anything about it unfortunatley. Next up Oklahoma city, only a four hour drive there. Today I feelt like writing some thing funny, and then I got the idéa. 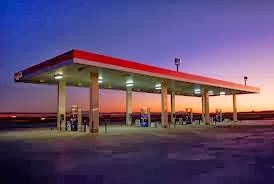 The states in america has some pretty weird and funny laws and on our journey we are gona travel to several states so im going to tell you some of the laws there is in the states. Most of the laws does not regard the whole state just parts of it. It is against the law to throw a ball at someone´s head for fun. In Carmel wich is a town in New York it´s unlegal to be seen in public wearing a jacket and pants that does not match. In Greene during a concert it´s unlegal to eat peanuts and walk backwards on the sidewalk. In Staten Island you may only water your lawn if the hose is hold in your hand. A state law requires that a man´s female companion shall call him "master" while out on a date, the law does not apply to married couples tho. Servers are forbidden to serve wine in a teacup. A women should not appear in a bathing suit on a highway. Anyone caught wearing sagging pants to expose underwear will be subjected to a fine up to 150 dollars plus court costs or face up to 15 days in jail. it´s illegal to take a lion to the movie. It´s not legal for a tavern owner to serve beer unless a nice kettle of soup is also brewing. It´s illegal to have a sleeping donkey in your bathtub after 7 AM. I said that the further west we drove the better the weather would get, what i meant by that was that the closer to Arizona and California we got the hoter the weather would get. I just wanted to make that clear so everyone would understand. 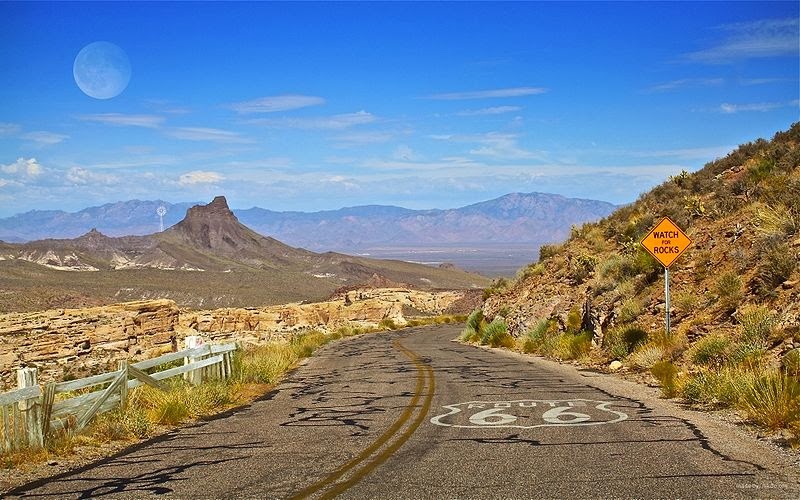 What is most amazing of all is that the makers of the movie cars travelled along route 66 to get inspiration to the movie so all the things you see in the movie is things that inspired the makers when driving along route 66. The town that Lightning McQueen gets stuck is called Radiator Springs in the movie, in real life it´s called Peach Springs. Peach spring is located next to the route 66 and had many travellers driving by it in its glory days but exatcly as in the movie the goverment builded a highway 25 miles from the town leaving route 66 almost empty wich caused many towns to become ghost towns. 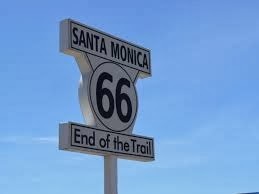 Driving on route 66 has been an amazing experience even tho we haven´t drived for that long, im really looknig forward for the things we will see and experience on this pice of history.